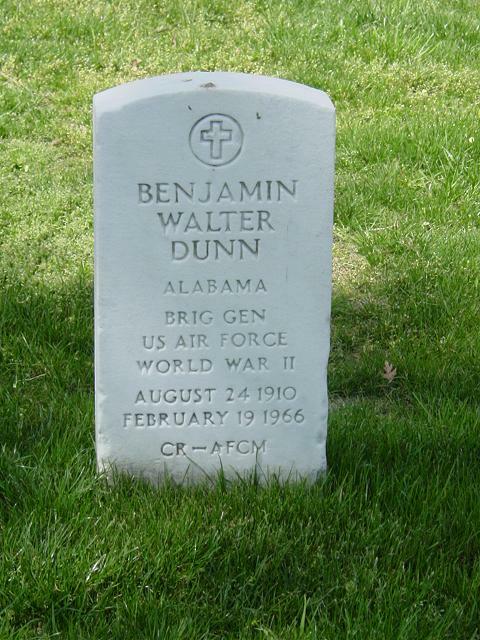 Benjamin Walter Dunn was born in Richmond, Missouri, in 1910. He graduated from Richmond High School in 1928 and entered the University of Missouri for training that same year. In 1932 he entered the Kansas City Western Dental College and was awarded a doctor of dental surgery degree, in 1935. He received a reserve commission as a first lieutenant in the U.S. Army Dental Corps in December 1935. He commenced private practice in Columbia Missouri, in 1935 and continued until his commission as a First Lieutenant in the Regular Army Dental Corps in July 1938. Lieutenant Dunn's first assignment as a Regular Army officer was Fort Sill, Oklahoma. In April 1941, he was ordered to the Station Hospital, San Juan, Puerto Rico where he served as a prosthodontist, establishing the first dental laboratory to serve the Caribbean area. in the specialty of Prosthodontics at Kansas City Western Dental College. In August 1946, Major Dunn was assigned assistant commander of the Central Dental laboratory, Fort McPherson, Georgia, and remained with that assignment until July of 1948. At that time he was ordered to Lackland Air Base near San Antonio, Texas where he was assigned as Prosthodontist and officer in charge of the Dental Laboratory. Effective July 1, 1949, he transferred to the Regular Air Force with the establishment of the Air Force medical services. August 1952, Lieutenant Colonel Dunn embarked for an assignment as wing base dental surgeon, USAF Hospital, Wiesbaden, Germany returning to the United States in July 1955. During this tour, he established the first area dental laboratory service for Air Force bases in Europe and England. From July 1955 until January 1958, he was wing base dental surgeon at the USAF Hospital, Randolph Air Force Base. Following this assignment, he was reassigned to Lackland Air Force Base as chairman, Department of Prosthodontics, and served in this capacity until September 1960. He was instrumental in developing the intern, residency and postgraduate training programs for dental officer, in the specialty of prosthodontics. In October 1960, Colonel Dunn reported to Headquarters Pacific Air Forces, Hickam Air Force Base, Hawaii where he was assigned as assistant for dental services in the Office of the Surgeon. In June 1963, he was assigned to Headquarters U.S. Air Force, Office of the Surgeon General, as deputy assistant surgeon general for dental services. On July 1, 1964, he was appointed assistant surgeon general for dental services and was promoted to brigadier general September 24, 1964. General Dunn is a member of the following professional and social organizations. His great, grandfather, Colonel Benjamnin Brown, served in the Confederate Cavalry and was killed in the Battle of Wilson Creek. He was president of his senior class in dental school. General Dunn is best known in professional dental circles for his work in establishing the U.S. Air Force Area Dental Laboratory program, and his contributions as a clinician, teacher and writer. General Dunn was buried with full military honors in Section 34 of Arlington National Cemetery.